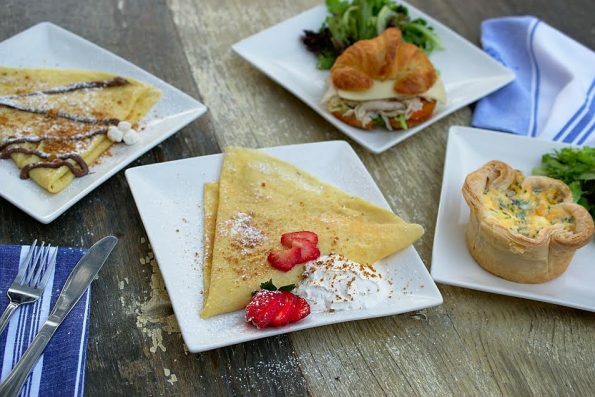 The family-run creperie, The Crepe Club, will celebrate the opening of its new location in the Biltmore Fashion Park by giving away free crepes on Tuesday, October 18. Guests will be able to get a free Nutella or Parisian (butter and sugar) crepe at the restaurant from 8:30 am – 9 pm. The new location is on the west end of the Fashion Park beside William Sonoma at 2502 E. Camelback Rd., #130. Arizona State University alums Karim, Fares and Omar Tarabichi a started The Crepe Club as a food cart on the ASU Tempe campus two years ago.. The crepes were so popular they soon had two carts and have now opened their first “brick and mortar” restaurant. The recipe for The Crepe Club’s signature item comes from the Tarabichi’s favorite creperie in Paris – a small kiosk on the famed Boulevard Saint Germain. The family reached out to the owners to share the recipe which was modified only slightly for the Phoenix restaurant. At its essence, it is still an authentic Saint Germain crepe,” Fares said. The Crepe Club menu includes sweet and savory crepes in two sizes. Prices range from $3.65 for the small Parisian sweet crepe to $8.95 for the regular Chicken Florentine savory crepe. The restaurant also serves French pastries baked fresh from scratch daily and French-inspired dishes like Quiche Lorraine, Croissant French Toast, croissant and baguette sandwiches, Paninis, and salads. To drink, The Crepe Club has fresh pressed juices, shakes, coffee, and tea. For the opening on Tuesday, October 18, guests can get one free regular sized Nutella or Parisian crepe per person. The offer is good for dine in only during The Crepe Club’s business hours of 8:30 am – 9 pm. Additional details about the menu and location, find The Crepe Club online at TheCrepeClub.com, on Facebook, Instagram and Twitter @TheCrepeClub.